Jacques Demy's movie of Lady Oscar frequently moved me. It is not a "swashbuckler" in spirit, it does not glamourise violence; it is not a movie about "girl power". It is a tragedy that raises important questions about freedom and gender. After becoming father to a series of daughters whose mother dies in childbirth, Général de Jarjayes decides that his latest daughter will in fact be a son, Oscar, and brings her up to be an heir and defender of the de Jarjayes name. He is delighted to find her a position as bodyguard to Marie Antoinette. Oscar is unquestioning of the system into which she is inducted, a bubble of privilege, acid wit, and decadence. She is dutiful and she "knows her place". At the same time the young boy and later groom who was her companion when Oscar grew up seems to have much more class consciousness. What her gender transformation helps to do is to de-romanticise the material, when Oscar accepts a duel, the result, devoid of machismo, comes off as a banal murder, which is precisely what it is. 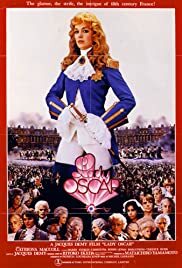 It is difficult to wholeheartedly see Oscar as an éoniste or transgender hero as her identity as Oscar is created for her by her father. Indeed her self-actualisation is intertwined with her accepting a more female identity. On the other hand she does use her identity as Oscar to react against male society, and becomes a role model for some of the Versailles women. Oscar, despite adopting a male role, is not free. This is potentially quite an important point of the movie, equality and freedom are not the same thing. Her role is to hang around the wilful and indolent Antoinette, and she develops a strong sense that her life has become meaningless. To become a man is not to have meaning, it's an escape from a trap within a trap, the outer trap being the Ancien Régime in the case of this movie. When Oscar attempts to enter a regiment, her male soldiers refuse to obey her, and her superior officer gives her no support whatever. In any case the regiment only exists to suppress the people. At a very late stage Oscar finds freedom in an act of defiance. You can feel the weight lift off her shoulders as she spends her first day as a truly free adult, despite residing in a prison cell. This feels very contemporary, freedom is something very few of us are born with, it's something we have to seize, it's profoundly personal and cathartic. Another reviewer on this site refers to Barry Lyndon as inspiration, "Now the magic of that was its carefully spaced vacuums. It had engineered emptiness, something that only a master could do." That is definitely something Lady Oscar is attempting, in my belief it worked better than my fellow reviewer felt. A note on historical accuracy. Thomas Jefferson described Marie Antoinette as, "...proud, disdainful of restraint, indignant at all obstacles to her will, eager in the pursuit of pleasure, and firm enough to hold to her desires, or perish in their wreck." That is exactly how she is portrayed in Lady Oscar by Christine Böhm. Jefferson also describes the relationship between the King and the Queen thus, "he had a Queen of absolute sway over his weak mind and timid virtue..." Again this seems to have been very well captured in the movie. Lady Oscar is a politically complex movie which seems often to have been misjudged by relying on a fruitless comparative analysis with the animé and manga sources of the story. Whilst actually quite serious it does however have its gorgeous moments.